A difficult set to the high numbers, these are also notorious for major centering issues. The offered set is simply a superb Near Mint overall set. Collected with great care by someone with a very good eye and a lot of patience, this is well centered overall. The high numbers look terrific, the set is a striking Near Mint overall and is simply a pleasure to peruse. Seventy-five graded cards (all PSA but one) come with the set, these will be noted specifically on our web site. The SMR value of just the 75 slabbed cards is a very conservative $2,546. 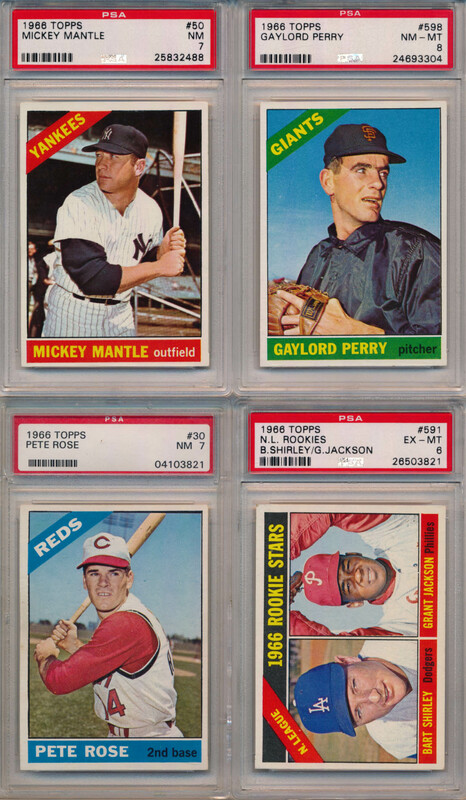 The key cards grade as follows: 1 Mays Strong Ex-Mt+ (possible 7 on the right day), 30 Rose PSA 7, 50 Mantle PSA 7, 100 Koufax Ex-Mt+, 110 Banks PSA 8, 126 Palmer RC PSA 6, 215 Clemente/Aaron Mays Ex-Mt+, 254 Jenkins RC NM, 288 Sutton RC NM, 300 Clemente Ex-Mt+, 310 Robinson PSA 5, 365 Maris NM w/tiny wrinkle, 390 B. Robinson Ex-Mt+, 410 Kaline PSA 6, 500 Aaron NM, 526 Twins Team Ex-Mt+, 530 Roberts PSA 9 oc, 540 McLain PSA 7, 547 Clarke PSA 6, 550 McCovey SP PSA 6.5, 561 Choo Choo Coleman PSA 8, 580 Williams SP PSA 7, 583 Tigers Team Ex-Mt+, 590 Skowron PSA 8, 591 Jackson RC SP PSA 6 and 598 Perry PSA 8. Please note we split hairs with the many Ex-Mt Plus grades here, many of these could well end up in 7 holders. If you do not want a fully slabbed set but want a sharp and fine 66 set, it would very, very hard to do any better than this great looking lot. FULL LISTING FOR WEB: 7 7, 8 7.5, 30 7, 50 7, 84 7, 108 7, 110 8, 111 7, 120 6, 128 6, 141 7, 198 8, 210 8, 211 8, 223 7, 224 6, 232 8, 235 7, 242 6, 251 8, 261 7, 276 8, 296 7, 297 7, 304 7, 310 5, 314 8, 316 7, 327 8, 333 7, 338 8, 341 7, 342 7, 345 7, 347 8, 359 8, 362 7, 364 7, 366 7, 367 8, 374 7, 382 7, 384 8, 407 8, 410 6, 418 8, 421 8, 422 6, 430 5, 511 7, 515 8, 525 8, 527 6.5, 530 9 oc, 538 7, 539 7, 540 7, 547 6, 550 6.5, 552 7, 554 6, 556 7, 560 8, 561 8, 562 7, 563 8, 564 7, 574 8, 576 6, 580 7, 585 7, 586 7, 590 8, 591 6, 598 8.